Winemaker’s Notes: Straw colored with green hues. On the nose the wine is fresh and citric, with notes of peaches with hints of gooseberry. Gentle, round and mouthfilling with crisp acidity. Clean and bright, this wine is best when served chilled. Enjoy with ceviche, oysters, and sushi. My Review: Fall may be here, but it’s still pretty warm here in Raleigh, NC (as I write this it’s 63 outside, the coolest it’s been so far), which means it’s still appropriate to sip on crisp, refreshing Sauvignon Blanc, especially when pairing it with a spicy shrimp dish. 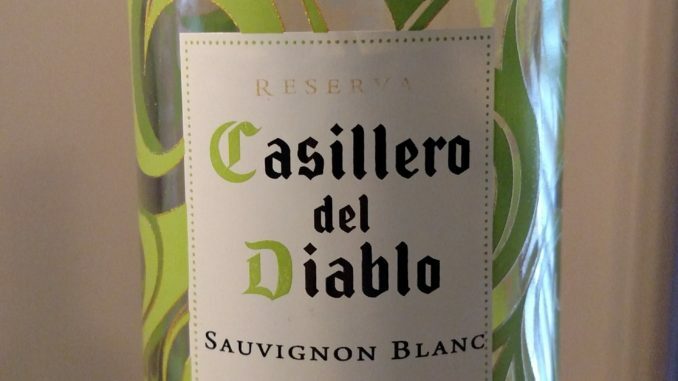 Enter the 2016 Concha y Toro Casillero del Diablo Reserva Sauvignon Blanc. In the glass the wine showed hues of green amidst the light yellow/straw coloring, and on the nose I picked up crisp citrus notes along with gooseberry. In the mouth the wine was nice and crisp, with the citrus from the nose carrying through, joined by flavors of lemon and a touch of the gooseberry. My wife and I paired the wine with a quinoa shrimp fried rice – it’s a favorite of ours with a good amount of spice to it, making the Casillero del Diablo Reserva Sauvignon Blanc a good pairing; the crisp acidity of the wine helped to balance the spiciness of the food to create the balance that I think we all look for when pairing wine and food. I’ll admit that I’m partial to Chilean Sauvignon Blanc – while the region wasn’t my first exposure to the grape, the crisp acidity and prominent citrus notes (particularly lime and grapefruit) resonated with me and helped to make it a go-to in my house whenever my wife and I were looking for a light, refreshing wine. Is the 2016 Concha y Toro Casillero del Diablo Reserva Sauvignon Blanc the best example of the grape I’ve ever had? No. Is it a great value at $11? Absolutely. I’ve paid more for Sauvignon Blanc that wasn’t any more impressive, and was often less impressive. This is a great bottle to pick up and share with friends or to sip on a Tuesday when you just want something that’s easy to drink and will pair with a variety of foods.